The Slide Out Office Storage Cabinet can also second as desk dividers for extra privacy from your neighbors. Open the Slide Out Office Storage Cabinet by UPLIFT Desk to inspect the cabinet's two compartments and upper shelf that give you a place to safely store valuables, from your purse to sensitive work documents. Organize and house your most used items, like books, binders, and personal things, easily inside the cabinet's roomy, locking drawer. There's even a grommet on the back for easy routing of cords, so you can keep a secret charger plugged in inside at all times. Or install track lighting in the drawer for a storage solution that keeps everything in the right light. This cabinet is available in your choice of left of desk or right of desk placement. White and black color options ensure you'll have a stylish piece of furniture that's easily assimilated into a variety of office styles. Build your office beautifully and store your things securely with the Slide Out Office Storage Cabinet by UPLIFT Desk. Do I really need a storage cabinet? If you have a collection of items in your office that are starting to pile up or if you work at a height adjustable desk without adequate storage, then a storage cabinet can help! The Slide Out Office Storage Cabinet by UPLIFT Desk allows you to store small, medium, and large personal and office items safely within its sliding drawer. You'll get two separate compartments and an upper shelf for storing your stuff, and the whole cabinet locks for the utmost in office storage security. Do I have to choose a right side or left side of desk placement now? Yes, in order to choose a storage cabinet that opens on the correct side of your workstation, we require you to choose a left of desk or right of desk option. The drawer has a panel on the back and is only open on one side, so the orientation of the drawer cannot be changed once the unit is purchased. Due to the size and weight of the pre-assembled Slide Out Office Storage Cabinet, it must ship freight, and we want to make sure you're getting the right cabinet for your workstation before it leaves our hands. If you have any questions, don't hesitate to give our Support Team a call. 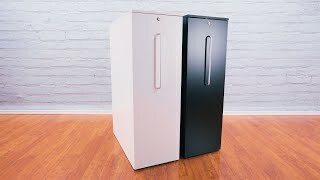 Does this storage cabinet come in any color options? The Slide Out Office Cabinet by UPLIFT Desk comes in black and white color options. We know you'll love the Slide Out Office Cabinet thanks to its super secure, locking, slide-out drawer. Easily store your purse and even keep sensitive documents locked safely away in one roomy cabinet at your workstation. What kind of things will this cabinet hold? Thanks to the spacious drawer and two internal compartments in this cabinet, you can store paper, folders, snacks, purses, photos, sensitive work documents, 3-ring binders, your baseball card collection, and more! The Slide Out Office Storage Cabinet by UPLIFT Desk is available in both black and white. The powder-coated surface will match your UPLIFT Desk frame and other desk accessories. For storage that makes a statement other than that of a messy office, look no further than the Slide Out Office Storage Cabinet by UPLIFT Desk. The Slide Out Office Storage Cabinet can be ordered with left or right facing drawers. The direction that the drawers face cannot be changed, therefore it is important to keep placement in mind so that you don't end up having to walk around the storage cabinet to access the drawers. If you need help deciding which setup will be best for your space, give our Sales Pros a call at 800-531-3746, and they will be happy to guide your decision-making. $999.00 List Price: $1,199.00* The list price is the same as the MSRP (Manufacturer's Suggested Retail Price). It may not necessarily be the price at which the product is sold.